I don’t know about you, but I’ve seen a lot of art critiques in my day. Even though artistic taste is subjective, even though everyone has their own aesthetics and set of experiences and education that they bring to the work; critiques are an important part of the artistic process. I often ask that question because I’ve witnessed so many critiques go badly. I’ve seen critiques end in tears. I’ve seen critiques end in fistfights. I’ve known an artist to quit after one particularly brutal critique. I’ve seen critiques where art students were inexplicably forced to stand alone in a hole as their work was being torn apart. A hole! I’ve seen critiques where students drank heavily as a survival method. I’ve seen critiques being led by drunk professors who should have known better. Needless to say, I am not a huge fan of critiques. They’re necessary because as artists, we need feedback on our work. And we crave it because we know that it’s only through fair and honest feedback that we can grow. But it’s that “fair and honest” part that’s challenging. Enter Liz Lerman: a brilliant choreographer, performer, writer, educator and speaker. This is a formal critiquing process that fosters deeper conversations around feedback. It gives structure to critiques. It was created for artists by an artist. When I watched a critique take place using The Critical Response Process, I didn’t see a single tear shed. Amazing! In fact, what I did see really blew me away. The Critical Response Process begins with an artist presenting their work. It can be visual art, it can be a performance, it can even be an idea. And you don’t have to be an established artist to receive feedback, this is for artists at any stage of development. So as I said, it begins with the artist presenting their work. The responder(s) will then spend time telling the artist what they find interesting, beautiful, or meaningful about that work. No negative comments are allowed! In the next step, the artist gets to ask questions of the responder. It’s vital that here the artist stay focused and on topic. It’s also important that the artist structure each question neutrally. Do you think this frame is pretty? is not a neutral question. Does this frame contribute to the work? is a neutral question. The responders will answer the questions BUT they can only express a personal opinion if they are directly asked for it. They will also not use this time to suggest changes. The focus remains purely on answering the artist’s questions. Up next is the responder’s time to ask questions of the artist. Again, it’s imperative that the questions remain neutral. By neutral I mean that the questions don’t already have an opinion already couched within. For example, Why did you choose such an ugly frame? is not a neutral question. But Tell me your decision process behind choosing frames? is a neutral question. Now it’s time for the responders to state their opinions. Drumroll… In a traditional crit, this is usually where the drama begins. But The Critical Response Process maintains that each responder must ask permission before stating an opinion. I have an opinion about your frames, would you like to hear it? And the artist maintains the right to say No, I don’t want to hear this opinion. 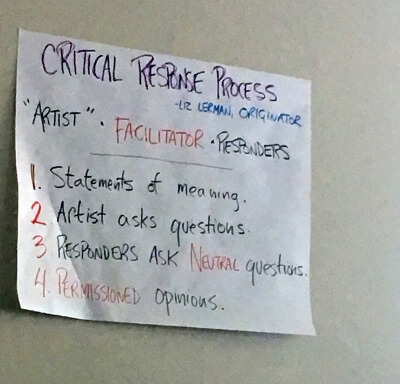 Liz Lerman suggests that the process works best when there is a facilitator, an artist, and the responder(s). I’ve seen the process used with just an artist and responder and, because they adhered to the structure, it worked just fine. In fact it worked more than fine! Nobody cried! Instead, I watched trust being built as mutual respect and understanding took place. I watched all parties involved transform. Why not try the process with your own art group? There’s a lot more to The Critical Response Process than I can include here. If you’re interested, I invite you to dive deeper by reading Liz’s book. Because listen, we’ve all been there. I too have been the victim of destructive art critiques – so I do understand just how paralyzing they can be. That’s why I was so excited to learn about The Critical Response Process and share this important tool with you. Do you want to learn more? Join my mailing list and watch your in-box for savvy art tips and inspiring stories.